Click above to download the complete list of claimed “safeguards” in assisted suicide bills provided by the Patients Rights Action Fund. Click above to download the complete list of Proposed Substitute Language for HB 7070, provided by the Connecticut Pregnancy Care Coalition. Opposition to assisted suicide is not ideologically fixed. Visit Disability Rights Education & Defense Fund for an excellent primer on assisted suicide, including examples of abuse. Please visit our page on assisted suicide for additional information. A majority of Connecticut residents oppose licensing doctors to assist suicide. 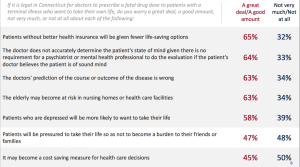 According the latest scientific poll of Connecticut residents from 2014, a 55% majority do not support licensing physicians to prescribe fatal drugs for terminally ill patients. 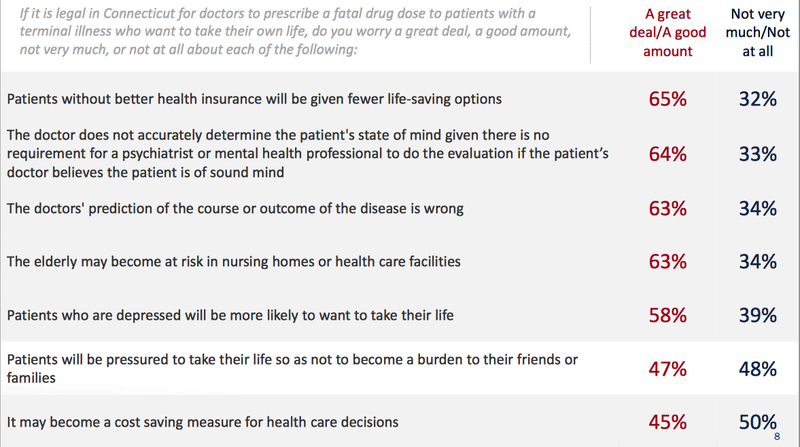 From the Marist Poll, a list of some concerns Connecticut residents have with assisted suicide. The assisted suicide lobby has had their discussion and lost. After spending nearly half a million dollars in three years, the out-of-state lobbying group that agitates for assisted suicide laws in Connecticut has had their discussion and lost repeatedly. In court, in 2009, 2013, 2014 and again in 2015 by failing to even have their bill scheduled for a committee vote. Connecticut residents like Maggie Karner, Cathy Ludlum and Elaine Kolb oppose assisted suicide and have publicly rebuked these bills and repeated attempts to pass it in Connecticut. In fact, notwithstanding being funded by George Soros, Compassion & Choices has dramatically decreased their level of spending in Connecticut in 2015 showing that the issue has failed in this state despite their enormous effort. Their spokesperson declared in a January 6, 2015 interview that “It appears that the electorate doesn’t care that much about it, no matter what the polling says.” The Connecticut electorate knows they would be better served by expanded access to early palliative and hospice care, increased funding for home health care workers and mandatory training for pain management techniques for medical students. These would be ways to help hundreds and thousands of Connecticut residents in ways that laws permitting assisted suicide cannot. The Truth About Assisted Suicide Still On The Fence About H.B. 7015?